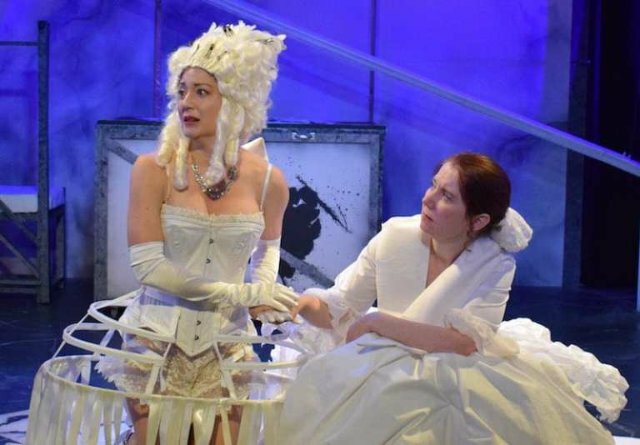 It’s Paris in 1793 and playwright Olympe de Gouges (Kat McDonnell) is trying to write a new play. Marianne Angelle (Kamille Dawkins as the invented character)) appears to discuss the revolution; she demands that Olympe write about France’s treatment of its slave colonies in the Caribbean, the source of its sugar, coffee and indigo. Marianne is from Haiti and she and her husband are in France to fight for their freedom. Lauren M. Gunderson has been the most produced playwright in America for the last two years, and her work has won several awards, including the Steinberg/American Theatre Critics New Play Award for I and You. Most recently, her play The Book of Will was produced in Chicago. Her other plays include Exit Pursued By A Bear, The Taming, Toil And Trouble, Silent Sky, Bauer, Emilie, and Miss Bennet: Christmas at Pemberley,co-authored with Margot Melcon.